News of the spectacular oil gusher at Spindletop raced around the world and ignited the imagination of the entire nation. “Oil fever” spread throughout the region. After hearing that the Spindletop discovery was drilled in an area where gas had been observed seeping out of the ground, five Jennings businessmen created “The S.A. Spencer Company” and leased an area surrounding several gas seeps near Jennings that had been known to exist for many years. ‍The businessmen sent representatives to Beaumont, Texas, to hire an operator who had experience drilling for oil at Spindletop. There they met with W. Scott Heywood and described their Jennings prospect. Heywood was fascinated with their tale and immediately went to Jennings to personally inspect the prospect area, where he became convinced that there was oil underground. In a short time Heywood and the S.A. Spencer Company had organized the Jennings Oil Company and stock was sold to finance drilling the property. 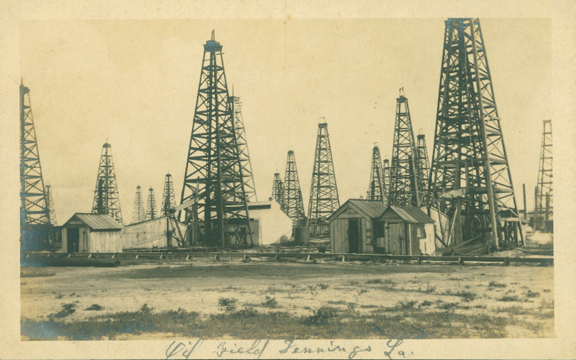 The Jennings Oil Company contracted with Heywood Brothers and Dobbins to drill two exploratory wells, each to a depth of 1000 feet, in the hope of finding oil. Their first location was in a rice field near an area of high land in an otherwise flat prairie. The high ground and associated gas seeps were similar to the area surrounding the Spindletop Field discovery. However, the landowner, Jules Clement, had a change of heart and decided he didn’t want any wells drilled on his property. He padlocked the fence gates and contacted a lawyer to cancel the oil lease. Clement complained that he didn’t want his cattle breaking their legs by falling into the holes. He then explained that he didn’t know what to do with the oil if any was discovered. Heywood convinced Clement that his fears were unfounded and paid him generously in advance for any damage to his rice crop. Clement agreed to allow the drilling of a well. 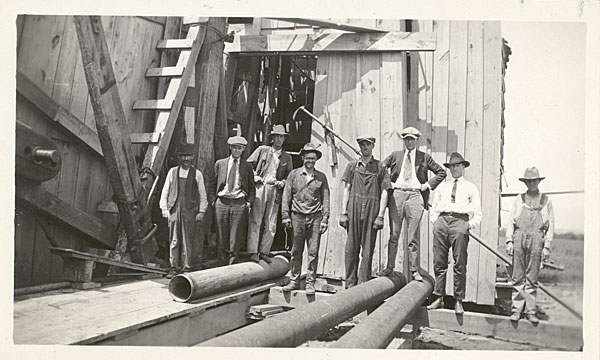 After reaching a depth of 1000 feet in the first well with little sign of oil or gas, the contract called for the abandonment of the first well and the drilling of a second well to 1000 feet at another location. After all, 1000 feet had been deep enough to discover the tremendous oil gushers at Spindletop Field. But Heywood believed he needed to drill deeper. Based on little more than a hunch, W. Scott Heywood convinced his investors, his drilling crew, and his own brothers to drill deeper. Instead of drilling two wells to a depth of 1000 feet each, Heywood persuaded the investors to change the contract to accept a single well drilled to a depth of 1500 feet, or deeper under his advisement. More drilling pipe was brought in and the well deepened. After drilling to 1500 feet in depth, only a small showing of oil had been found for all their time, trouble, and expense. Many investors were bailing out, selling their $1 shares in the venture for as little as 25¢.Heywood’s associates, drilling crew, and even his own brothers were telling him to abandon the well. ‍Despite the urging of his family, friends and associates, Heywood’s intuition told him to drill still deeper. At the age of 29, W. Scott Heywood was already a seasoned, experienced, and successful explorer. He had gone to Alaska in 1897 during the great Yukon gold rush, sinking a shaft and mining a profitable gold deposit. He was an oil finder, having successfully drilled for oil in California. When news broke of the Spindletop discovery, Heywood was one of the first “oil men” to reach Spindletop, and he drilled a number of the earliest successful oil wells. Heywood came to Jennings at the urging of investors and now he was convinced that the gas seeps were a sure sign of oil. Reluctantly, W. Scott Heywood’s brothers once again agreed to support him in continuing. More drill pipe was delivered and the well was drilled deeper. While drilling at 1700 feet, with only 4 feet left to go on his last piece of drilling pipe, Heywood drilled into the top of a sand showing good signs of oil. Heywood ordered additional drill pipe to continue drilling through the oil sand. The drill pipe arrived and drilling stopped after penetrating a total of 110 feet of the oil sand. Equipment was ordered to test and cap the well; Heywood had to wait several days for the equipment to arrive. Finally, on September 21, 1901, the equipment had arrived and the well was ready for testing. The well was bailed to remove the drilling mud and draw oil into the well. Nothing happened. The well was bailed again. Finally, a 4 inch stream of oil came gushing out of the well, spewing oil over 100 feet into the air.